Century has an extensive casegoods facility with state-of-the-art woodworking capabilities and a sophisticated finishing operation, as well as three upholstery factories – all located in Hickory, North Carolina. With more than 60 years of stable growth, an experienced and aggressive management team and considerable investment in new technology, Century is meeting the challenges of the 21st century. Harley Ferguson Shuford, Sr. established Century Furniture Company in 1947 as a selling agent for local upholstery lines. A year later, he built a casegoods plant in Hickory, North Carolina and manufactured an 18th century style mahogany dining suite that shipped the following January. Today Century’s Wood Products Division offers a variety of styles comprised of more than 700 different items. The company is known for managing the complexities of a broad product line while continually improving its quality and service. In 1952, Mr. Shuford hired Raymond K. Sobota to design for Century. Sobota's long-running Citation Collection became a major force in establishing the company's reputation as a style leader and was only one of many outstanding, successful collections; the partnership between Century and Sobota endured for more than 40 years. In 1957, Mr. Shuford purchased the stock of Longview Furniture Company and the facility became Century's Upholstery Division. The plant is a complete manufacturing entity with its own machining, frame fabrication and upholstering operations specializing in custom upholstery. Customers may select from more than 2,500 fabrics in the line or furnish their own material for application to any of nearly 300 frame styles. A wide array of cushion fillings, trims and finishing details is available for creating furniture that is highly individual and often unique. Construction of a third operation, the Century Chair Division, began in 1964. Through the years, this successful facility has grown to more than 100,000 square feet and employs more than 200 people to produce dining and occasional chairs. Century Chair has developed an impressive finishing competence that affords customers an extraordinary range in finishes and customization. Additionally, the Chair plant makes a wide range of contract product. By combining global sourcing with the extensive manufacturing capabilities of this large facility, Century is able to offer a comprehensive product line in a broad range of styles and prices. 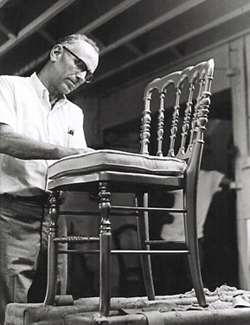 In October 1967, Harley F. Shuford, Sr. retired from daily operations to become Chairman of the Board of Century Furniture. His son, Harley F. (Buck) Shuford, Jr., who had been with the company for several years, was named President. In 1971 a separate company called Shuford Furniture was established for the volume production of high-style, lower-priced upholstery in a newly acquired 50,000 square foot facility. Alex Shuford II, also a son of Century’s founder, joined the organization to manage that operation as its President. In 1980 Shuford Furniture merged with Century and became the Shuford Division. Alex Shuford was named Senior Vice President with operational and financial responsibility for all of Century's upholstery units. This operation merged with Century Upholstery in 2008. Century's international business also began in the 1970s, with Harrods of London as its first customer. Today the company ships its products to more than 40 countries around the world. A fifth plant was launched in 1981 to manufacture Century's LTD Collection, a mid-priced upholstery line. This 70,000 square foot facility, located in Longview adjacent to the Chair plant, was connected in 2007 to the Chair plant and resulted in greater efficiencies for both product lines. In September 1983, Harley Shuford’s daughter Nancy joined the company to manage its advertising and public relations, later becoming Senior Vice President of Advertising and Marketing. In 1984, Century moved its showroom from Hickory to the Market Square Building in High Point. Today the 85,000 square foot showroom takes up the entire fifth floor of the building, where Century's full line of furniture is shown during the semi-annual International Home Furnishings Market each April and October. Century owns and operates showrooms for the design trade and has agent showrooms in Atlanta, Boston, Chicago, Denver, Dania FL, New York, Philadelphia, Scottsdale AZ, Washington DC, Los Angeles and Laguna Niguel, CA. In 1987 Century's Leather Division was created under the Upholstery Division and operated in its own facility in Longview. This unit was later merged into the LTD facility for improved operating efficiency. Following the passing in November 1994 of Century's founder, his son Harley F. (Buck) Shuford, Jr. was elected Chairman of the Board. On December 31, 1995, he turned over the presidency of Century and, along with his brother Alex and sister Nancy, retired from the company's day-to-day operations. All remained on the Board of Directors. Bob E. McKinnon, then president of Century’s sister company Valdese Weavers, was named President and CEO for CV Industries and Century Furniture and held both positions for the next four years. In 1995 Century acquired two companies and formed new divisions. The Heirloom Division produced high-end custom upholstery, and later wood items as well, for the professional design trade. The former Chaircraft Company, maker of mid-priced chairs for the hospitality industry, was acquired as Century's new Contract Division and was merged into Chair plant production. After the decision was made to focus only on the upper end of the contract business, the brand name was dropped. 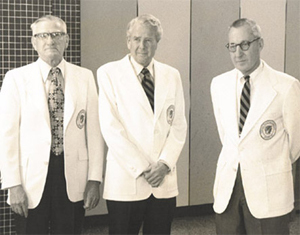 In October 1995, Harley (Buck) Shuford, Jr. was elected to a permanent place in the American Furniture Hall of Fame in recognition of his wide-ranging service in areas of lasting benefit to the entire industry. On January 1, 1997, CV Industries implemented an employee stock ownership plan (ESOP) whereby the Shuford family shares ownership with their employees. It was the largest ESOP implemented in the nation that year. On January 1, 1998 Century underwent a major transformation for doing business in the 21st century. Following a year of painstaking preparation, a computerized enterprise resource system called SAP was implemented to link all the company’s functions – from the purchase of raw materials, through the order and acknowledgment process, to scheduling, production, inventory management, and finally the invoicing and tracking of receivables. SAP provides rapid, comprehensive, up-to-the-minute information for management analysis and action plus customer visibility of product availability and order tracking. In June of 2000, the Board appointed Alex Shuford, II to the position of President and CEO of parent company CV Industries. Also at that time, Robert J. Maricich was named President and CEO of Century Furniture. For the next seven years, Maricich and the CV Industries Board steered the company through a downturn when much manufacturing moved overseas and many U.S. factories closed their doors. Meanwhile, Century capitalized on its strengths and expanded its efforts in the professional design market while increasing their customers' options for customizing the product. In January 2008, Maricich left Century and the manufacturing sector. The CVI Board appointed Alex Shuford, II to lead Century. Shuford’s role behind the scenes in determining Century’s direction had been ongoing and ensured a transition with minimal disruption. Shuford lead Century through the bottom of the Great Recession and was instrumental in ensuring Century’s value and brand remained strong despite the weak consumer market and loss of numerous large retail partners. In 2010, the Board named Eric S. Schenk to the leadership post at Century. Having worked at Century in numerous positions throughout his career, the most recent post as Vice President of Operations, Eric was able to strengthen Century’s core business and continue the restructuring that Alex Shuford had started. Throughout Century’s history the leadership had been working on environmental policies and changes through its operations as a metric of both efficiency and stewardship. A predominantly domestic manufacturer, being a good corporate citizen is built into the company’s values starting with its founder, Harley F. Shuford who was a huge supporter and contributor to many of the civic projects in Hickory, NC and surrounding areas. One of the largest areas of concentration for Century’s environmental footprint was regarding the wood supply chain and the regulations of the forests where Century’s wood was obtained. Lead by VP of Global Logistics, Roger Jones, Century implemented a responsible purchasing policy, which certifies that the wood Century buys comes from sustainably managed forests. This change culminated in a trip to Honduras where Century’s team met with the Minister of Defense and ultimately changed the laws governing forestry for the country ensuring that the foresters there can earn a fair wage, and that the forests will be sustainable for generations to come. Century is certified as an EFEC company. The corporate offices and each of its manufacturing facilities have been EFEC certified since 2010. In addition, Century Furniture obtained their Sustainable by Design registration in 2010 and became a SFC/Rainforest Alliance company in 2013. Both EFEC and Sustainable by Design are audited and continuous improvement recognitions. The company continues to lead the industry in their efforts to develop processes for ensuring good stewardship of our natural resources. In July of 2013 Alex Shuford, II, and his children, Nancy Shuford Bledsoe, Alex Shuford, III, Comer Shuford Wear and Eliza Shuford Hucks, formed RHF Investments, Inc. and acquired Century Furniture from the parent company CVI making them the sole owners of Century Furniture and its wholly owned subsidiaries. At this time Alex Shuford, III, was named President of Century Furniture, marking the succession of the third family generation to lead Century. Also in July, Century Furniture was awarded the ICON 2013 AmericasMart Medal of Excellence Honor. The honor marks and celebrates Century Furniture’s long-standing role as a leading force in the American home furnishings design pantheon – maintaining levels of workmanship, craft and quality. Past recipients have included the Museum of Modern Art in NYC, Historic Williamsburg, Anthropologie, and Restoration Hardware. In October 2015, the company acquired Hancock & Moore, Jessica Charles, Randall Allen and Cabot Wrenn along with their manufacturing facilities. The acquisition positions the company as the largest manufacturer in the high-end segment of the furniture market. The company also purchased a key building in Longview, NC in which they have consolidated all of their shipping allowing for better service and delivery to their retail and designer partners. Today the Rock House Farm family of brands consists of over 1,300 associates with a management team conditioned for growth. Continually investing in product design, customer service, technology, and its people, the company is meeting the challenges of today while planning for the opportunities of the future.